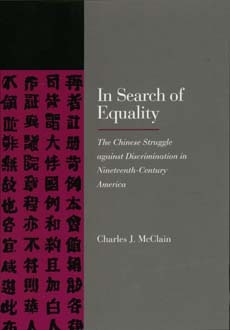 Charles McClain's illuminating new study probes Chinese efforts to battle manifold discrimination—in housing, employment, and education—in nineteenth-century America. Challenging the stereotypical image of a passive, insular group, McClain reveals a politically savvy population capable of mobilizing to fight mistreatment. He draws on English- and Chinese-language documents and rarely studied sources to chronicle the ways the Chinese sought redress and change in American courts. McClain focuses on the San Francisco Bay Area, the home of almost one-fifth of the fifty thousand Chinese working in California in 1870. He cites cases in which Chinese laundrymen challenged the city of San Francisco's discriminatory building restrictions, and lawsuits brought by parents to protest the exclusion of Chinese children from public schools. While vindication in the courtroom did not always bring immediate change (Chinese schoolchildren in San Francisco continued to be segregated well into the twentieth century), the Chinese community's efforts were instrumental in establishing several legal landmarks. In their battles for justice, the Chinese community helped to clarify many judicial issues, including the parameters of the Fourteenth Amendment and the legal meanings of nondiscrimination and equality. Discussing a wide range of court cases and gleaning their larger constitutional significance, In Search of Equality brings to light an important chapter of American cultural and ethnic history. It should attract attention from American and legal historians, ethnic studies scholars, and students of California culture. Charles J. McClain is Vice Chairman of the Jurisprudence and Social Policy Program and Lecturer at the Boalt School of Law at the University of California, Berkeley.